Without this 8-10 kicker on day 5, Jared Lintner most likely wouldn't have qualified for the Championship Round at Lake Chickamauga. 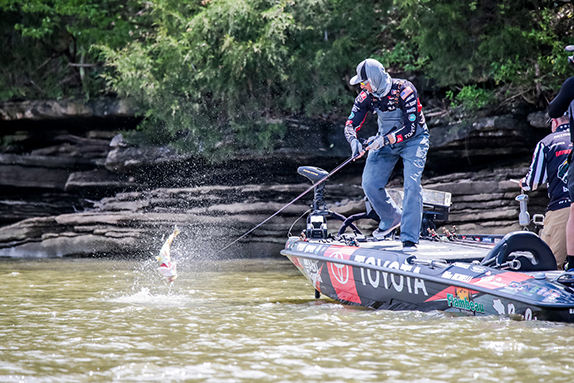 It didn’t seem to matter where anglers went at Lake Chickamauga during last week’s Bass Pro Tour, the fish were shallow, and they were biting. The event showcased the lake’s burgeoning population of bass – more than 3,800 fish were caught weighing more than 7,400 pounds – despite the lake receiving intense fishing pressure throughout the week. The key to gaining separating from the field, though, seemed to be just that – finding key stretches off away from the crowds. Whether it was up river from Dayton (like winner Andy Morgan or third-place finisher Todd Faircloth) or in the dirty, warm water of the Hiawassee River (like fifth-place finisher Mike Iaconelli), having areas that weren’t constantly being pounded was a dominant theme for the rest of the top five. This was Jared Lintner’s second visit to Chickamauga and in practice he found a backwater with some clear water and hydrilla in it. He felt like the fish in those areas were safer bets with the fluctuating water levels. He started the Group B Shotgun Round in the backwater he found in practice and caught several before moving on to other areas. It turned out to be a blessing as he came across the big fish of the tournament at his next spot. Catching the 8-10 solidified his spot in the finals. “I was fishing down a stretch and I’d caught a couple and I’d fished there the day before, but didn’t see anything,” he said. “I look down and see a giant swim off a rock. It’s a little mud flat, maybe 20 feet long and there’s one white rock on it the size of a volleyball. I hadn’t seen it before. His primary tactic was powershotting, a souped-up dropshot fished on casting tackle. A Ned rig was also productive, especially on the final day in areas protected from the wind. > Powershot gear: 7’5” medium-heavy Ritual Angling casting rod, Shimano Metanium HG casting reel, 14-pound Sunline Shooter fluorocarbon line, 3/0 Lazer TroKar straight-shank worm hook, 6” Fat Roboworm (Aaron’s Magic), 1/4-oz. EcoPro Tungsten Full Contact dropshot weight. > Neko rig gear: 7’1” medium-action Ritual Angling spinning rod, Shimano Exsence 3000 spinning reel, 12-pound Sunline SX1 braided line, 8-pound Sunline Shooter fluorocarbon line (leader), 2/0 Eagle Claw Lazer Sharp finesse hook, 3/64-oz. unnamed nail weight, Zoom Trick Worm (green-pumpkin), 5.8” Jackall Neko Flick worm (green-pumpkin pepper). > Ned rig gear: Same rod as Neko rig, same reel as Neko rig, same lines as Neko rig, 1/10-oz. Laser TroKar Pro V Ned Jig, Roboworm Ned Worm (Aaron’s Magic). 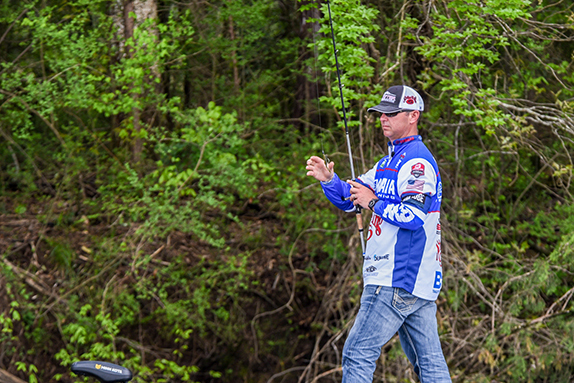 Todd Faircloth made a move upriver on day 2 and parlayed it into a top-3 finish. Todd Faircloth admits he’s still trying to figure out the most efficient way to practice for a Bass Pro Tour event, but he seems to have the tournament part figured out as it was a mid-tournament audible that earned him his highest finish yet this season. “Practice wasn’t great, but it wasn’t terrible,” he said. “I feel like I’m still trying to figure out how to practice for these. We basically get 1 1/2 days and it’s a lot harder to judge what you’re on. I find myself going into an area and if I get two or three bites, I used to fish the whole area. Now, you can’t do that. You have to cover as much water as you can and look at as much as you can because you don’t know what will change. Over the first 1 1/2 days, he was down lake where he caught fish flipping a creature bait and on a wacky-rigged worm. Halfway through day 2, though, he headed up river to fish some stretches with dirtier water. “That totally changed the outcome for me,” he said. “I avoided missing the cut to making a top 10. If I don’t make that call, I don’t get paid this week. The fish were not near as spooky and there was a lot less (fishing) pressure versus down the lake. There were fewer locals, too. I basically had it to myself. Up river, he targeted any piece of wood that was in the water, be it a blowdown or an overhanging tree limb that plunged into the water. A Texas-rigged creature bait was his preferred flipping option. > Pitching gear: 7’4” heavy-action Denali jig/worm casting rod, unnamed casting reel (7.1:1 ratio), 22-pound Sunline Shooter fluorocarbon line, 3/8-oz. Strike King Tour Level Tungsten worm weight, 3/0 Gamakatsu Heavy Cover worm hook, Strike King Rage Structure Bug (green-pumpkin). Jacob Powroznik spent the majority of the tournament with a spinning rod in hand, pitching a wacky-rigged worm to areas he felt fish may be spawning. When Jacob Powroznik arrived at Chickamauga last week, he pretty much knew how he was going to attack the lake. 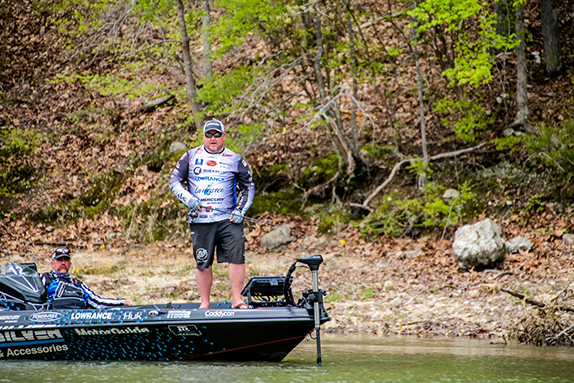 Heck, easing away from the ramp on the first day of practice, he spotted three bass on beds. That formula netted him a total of 100 bass over four days of competition, including a stout 36 for 67-14 in the Knockout Round alone. He tried to fish new water (to him) each day, but fished the same way all over the lake as he relied on a wacky-rigged V&M Baits Trickster worm. “It’s just a good way to generate bites this time of year,” he said. While the weather on the final day was an obstacle he ultimately couldn’t overcome, he had no regrets about how he managed the event. “I would do nothing different if given the chance,” he said. > Worm gear: 7' medium-heavy Quantum spinning rod, Quantum Smoke S3 size 30 spinning reel, 20-pound Hi-Seas braid (main line), 15-pound Hi-Seas fluorocarbon (6' leader), size 1 Mustad TitanX Wacky/Neko Rig Hook, 6” V&M Trickster (green-pumpkin violet). > Topwater gear: 6’10” medium-heavy Quantum KVD Tour Edition casting rod, Quantum Smoke S3 casting reel (7.3:1 ratio), 20-pound HI-SEAS monofilament line, Livingston Lures Walk N Pop 67 (shad). Mike Iaconelli spent most of his tournament in the dirty, warm waters of the Hiawassee River. Mike Iaconelli had competed at Chickamauga just once before – the 2014 BASSFest in which he finished 42nd – but it was knowledge he gained during that visit that helped him plot a successful course last week. He decided the closest he would get to the lower end of the lake would be mid lake, simply to avoid crowded areas and having to fish behind other competitors and locals. “I wrote a lot of that off and basically started with the mindset to look at new areas,” he said. That led him to the Hiawassee River, which flows into Chickamauga from the east. The water was dirtier and warmer in the Hiawassee and that’s what kept Iaconelli coming back. While those down the lake were focused on pre-spawn bass and some already in bedding mode, Iaconelli is convinced the majority of fish he caught were post-spawn. “It still blows me away, but they had of the typical post-spawn signs – bloody tails, sores on their gill plates, skinny,” he said. Iaconelli said 80 percent of his fish were caught winding a crankbait along natural rock and riprap where a channel or ditch would swing and hit the shore near the rock. He said the Lowrance C-Map feature, which allows users to shade different depth zones, let me pinpoint areas that had the ingredients he was looking for. “That allowed me to look at a spawning bay or creek and where those ditches or creeks would touch the bank,” he said. “When I found that combination around rock or riprap, that was pretty consistent. I didn’t catch as many big ones as others, but it just came together for me. > Crankbait gear: 6’6” medium-action Abu Garcia Ike Signature Delay Series casting rod, Abu Garcia Revo Ike casting reel (6.6:1 ratio), 14-pound Berkley Trilene Sensation monofilament line, unnamed square-bill crankbait (shad color), Rapala Brat 06 (pearl gray shiner). > He also caught several fish on a 1/2-oz. Molix Waterslash spinnerbait (shad) fished around docks where there was a shad spawn happening. > He caught a few pitching to laydowns with a 4” Berkley PowerBait Pit Boss (Okeechobee craw) rigged on a 4/0 VMC Heavy Duty flipping hook under a 5/16-oz. VMC tungsten worm weight.